What is ZÜCA’s Warranty Policy? ZÜCA warrants that your ZÜCA products are free of defects in materials and craftsmanship. This warranty does not cover normal wear and tear, accidental damage, misuse, improper care, skateboard contests or alterations. For more information on ZÜCA’s Warranty Policy, visit the Warranty Policy. Will I void my warranty if I customize my ZÜCA? We encourage you to have fun with your ZÜCA and you should feel free to customize it. However, keep in mind that any modifications made to your ZÜCA Frame or Insert Bag may void the warranty on the product. What is ZÜCA’s return policy? If you place your order within 30 days, you may send the unused product back to us for a refund. Call our Customer Service Department at 800-799-6548 for an RMA form. You will be assigned an RMA number. The RMA number will help us to know who the return is coming from, and make the return process a lot faster. 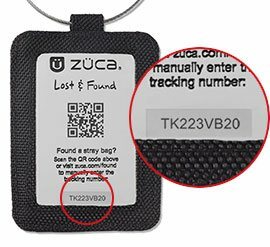 If your product was purchased from a retail store or a website other than zuca.com, please inquire about your return from the original place of purchase. Returned goods must be in perfect, unused condition with all original parts and tags. After 30 days, we are unable to accept returns for any reason other than manufacturing defects. Costs for return shipments are the responsibility of the customer. We recommend using a trackable shipping method. We may choose to reject the delivery of your package if you don't have an RMA number. My ZÜCA has a defect. What can I do? If you find that your ZÜCA has a defect, there are two options available. If your ZÜCA is covered by our warranty, visit our Warranty Policy page. If your ZÜCA is outside of the warranty period, visit our Replacement Parts page. If you find that the zipper is broken, it is not defective. Our zippers are self-repairing. Run the zippers back and forth until the teeth of the zippers align themselves, linking the rows together. After the rows have linked together then the zipper has repaired itself. Does ZÜCA offer a military discount? The military discount is offered solely through ZÜCA, Inc. and does not apply to any of our Authorized Retailers. Where can I find a valid promo code? From time to time we run promotions on ZÜCA’s Facebook page. We also offer special promotions via email. Subscribe to our email address at the bottom of our homepage. All promotions at www.zuca.com and ZÜCA’s Facebook page are offered solely through ZÜCA, Inc. and do not apply to any of our Authorized Retailers. Where can I order my ZÜCA? We have authorized resellers throughout the country. To search for a local authorized reseller near your location visit Find Authorized Reseller. You can also place your order online at zuca.com. Do I pay sales tax? Do I pay shipping charges? If your shipping address is within California, sales tax will be applied to your order. Sales tax is based on ZUCA’s corporate location, in Milpitas, California. If your shipping address is outside of California, sales tax is not applied to your order. Shipping costs vary based on shipping method and distance of travel. We offer free ground shipping on orders over $100 within the 48 contiguous United States. Expedited shipping is also available. Rates are provided during checkout. Yes, we ship to international addresses! You may place your order online at zuca.com at any time. Before confirming your order in the final steps, choose the appropriate shipping method. The number of days it takes to get to your destination are dependent upon United States Postal Service and vary by country. Shipping charges do not include customs and duties charges that may incur at your border. Customs/duties costs are determined when your order enters your country and are out of our control. When will my ZÜCA ship and how soon will I receive my order? Orders are shipped from our California distribution center and typically leave our warehouse within 2-3 business days from the time your order is placed. Standard orders will be shipped via ground shipping method. To the west coast, it will take approximately 2 business days for your package to be delivered. To the east coast, it will take approximately 5 business days. As always, weather permitting. Expedited shipping methods are available including 3 Day Select, 2nd Day Air, or Next Day Air delivery. Rates vary based on service level. Cut-off time for expedited shipping is 2:00 PM PST. If your order is placed after 2:00 PM PST, it will ship the following business day. Delivery schedules are calculated using business days, Monday - Friday. For example, a 2nd Day Air delivery, which will take 2 business days, shipped on a Friday will arrive on Tuesday. The day of shipment does not count as transit time. Next Day Air that ships on a Friday will arrive the following Monday. International shipping, via USPS Priority Mail or USPS Express Mail, will ship within 1-3 business days after the order is placed. When your order leaves our warehouse, you will receive an email notification that includes tracking information. Keep your email handy until your package is received. Email shipping notifications may get flagged as spam - please check your spam folder. ZÜCA has 8 models to suit your style. Some are assembled units and others may require some assembly. Get frustration-free assembly instruction manual here. The ZÜCA Flyer is an assembled unit that comes with pouches and a matching travel cover. Download a copy of the Flyer packing tips for your ZÜCA Flyer Travel. The ZÜCA Pro is an assembled unit that comes with pouches and a matching travel cover. Download a copy of the Pro packing tips for your ZÜCA Pro Travel. The ZÜCA Sport Frames and Sport Insert Bags are sold separately. The ZÜCA Pet Carrier Frames and Pet Insert Bags are sold separately. The ZÜCA All-Terrain Cart is an assembled unit. The ZÜCA Disc Golf Cart is an assembled unit that comes with disc golf rack and pouch. The ZÜCA Backpack Cart is an assembled unit that accommodates many bag/backpack makes and sizes. What’s the difference between the models? ZÜCA has 10 models that provide a variety of uses. For travel, the ZÜCA Flyer and the ZÜCA Pro are both FAA compliant and fit in the overhead compartment. The ZÜCA Skipper fits perfectly beneath airplane seats. Read about TSA’s rule on liquids. Read about TSA’s tips on carry-on baggage. Check with your airline for their regulations about carry-on luggage. For daily activities, the ZÜCA Sport is the perfect bag that requires minimal care. The two wheels in the back mean it will glide over curbs and stairs. For your pet, the ZÜCA Pet Carrier is the perfect size for your furry friends that weigh 15 lbs. or less. For outdoor adventures, the ZÜCA All-Terrain smoothly carries your gear off-road over rugged terrain. For disc golf players, the ZÜCA Disc Golf Cart packs everything you need to hit the course and take a seat when you need it! For disc golf players and outdoor adventures, the ZÜCA Backpack Cart and ZÜCA Backpack Cart LG turns your bag or backpack into a rolling cart for use on disc golf courses and any outdoor terrain. The ZÜCA Compact Disc Golf Cart is great for women or junior players as well as anyone who doesn't want to carry a lot of discs. Is the ZÜCA Insert Bag waterproof? The fabric is coated with 2 layers of polyurethane which make the insert bag water repellent but not waterproof. Light rainfall, will bead off of the insert bag. A heavy downpour, however will soak the bag. ZÜCA offers rain covers for the ZÜCA Sport, All-Terrain and Disc Golf models. When using soap or detergent on a fabric treated with a water repellent coating, there is risk of losing some repellency. Sunlight also diminishes the coating material. The repellent on our bags is very resistant to soap, most household solvents and sunlight. How do I clean my ZÜCA? Clean ZÜCA Frames using a sponge or soft cloth and mild detergent. Scrub gently, rinse and wipe dry. We have two different frame finishes. The Sport model is "Powder Coated” resulting in a non-toxic finish, more durable than paint. Using abrasive cleansers, steel wool or SOS pads may change the look of the finish. Magic erasers are recommended for difficult scuff marks. Clean ZÜCA Insert Bags using a cloth/brush and mild detergent. Rinse and let air dry. Insert Bags can be removed from the frame for cleaning. We recommend letting the ZÜCA Insert Bag dry, while in the frame, to retain shape. I don’t want my wheels to flash, what can I do? ZÜCA offers a black Sport Frame that has non-flashing-wheels. If you already have a Sport Frame, non-flashing wheels can be purchased separately. For more information visit the Replacement Parts page. Wheels on the ZÜCA Flyer and the ZÜCA Pro models do not light up. Flashing wheels can be purchased separately. For more information, visit the Replacement Parts page.